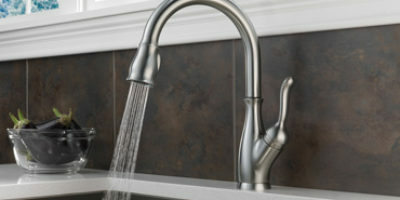 Another great faucet by Kohler with that difference that this is not a sensor based one. The water is turned on and off only from the handle, but overall it is still an amazing piece of accessory. 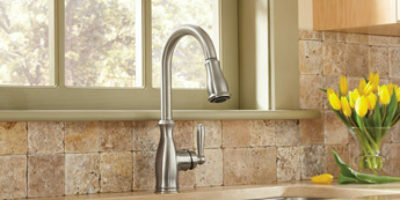 The K-596-VS Simplice from Kohler is a great kitchen faucet with lots of features that you’ll find very useful around the kitchen. It is a faucet not only great for washing in the sink but it’s suitable for actions out of it. One of the most important features is the disposable from the spout hose that is 68 inches long which is pretty impressive. You can use it not only to wash inside the sink but outside of it, like filling up bottles, water the plants etc. The spray head has multiple functions. Aside from the ability to be tilted for 360 degrees, the spray head has two options that can be switched with a single button – standard stream and sweep spray that you can use for cleaning certain things that the normal stream is not able to clean. Just like many of the other Kohler models, the K-596-VS has the popular and amazing DockNetik system. It is a system for easy docking of the spray head back to the spout. After you use the hose, you can simply let it go and the system will perfectly get the spray head back to its place by the use of magnetic force. It is a feature that really gives value to the whole faucet. 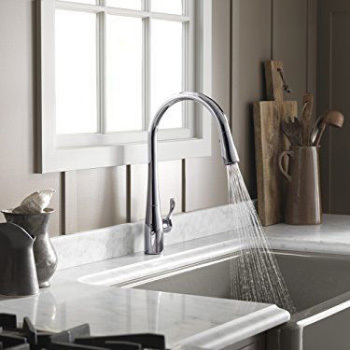 Since we are getting used to faucets using sensors to activate the water flow, we really miss this feature in this Kohler model. However, if this is not something that defines a good faucet for you, then you get a real value for money piece of kitchen material. 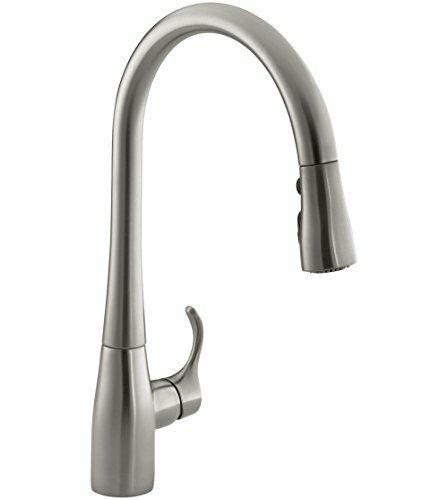 It is a high arc faucet with impressive 16.6 inches in height. This is pretty much enough for nearly all complex tasks you’ll have to make in the sink. Adjusting the temperature and the flow is done by the handle. Using it, you get the water flowing but there’s more than just pulling the handle down. With the help of the spray head buttons, you can get different types of streams and you can also pause the water flow. After you do what you needed to do, you can press the button again and continue your work. Even there’s no sensor backup for this model, it still looks pretty modern and stylish. There are three different options available considering the finishing. You’ll have to choose the one that suits you the most and is best for the overall style of the kitchen. There’s a silver option, a matt black, and polished chrome version. They are all made of metal and with beautiful finishing, but it’s a matter of taste which one will look the best in your kitchen. The impressively high arc make it look dominant in the kitchen. This look will be literally justified with the functionality this faucet has. With the hose that’s 68 inches, and the functions the spray head offers you can be sure that this is the best and the most useful part of the kitchen. The handle and the spray head are beautifully lined up with the spout. The whole faucet looks impressive and even though there’s no option for sensor turning on and off, there’s nothing lacking for amazing experience while using it. The hose and the spray head are made to be by far the best part of the faucet. The special ProMotion technology makes the spray head move in a full circle, in 360 degrees allowing the user to wash everything that seems impossible to be washed. Together with the nylon hose and the very useful ball joint, you’ll feel like there’s nothing you can’t do around the kitchen.